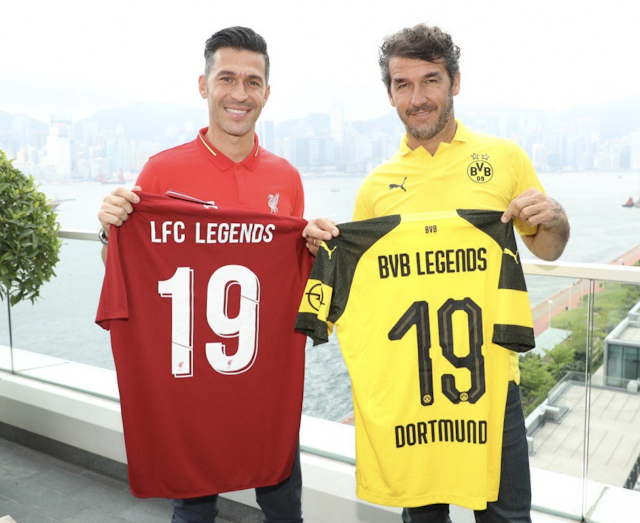 It was announced this week that a legends match between Liverpool and Borussia Dortmund would take place this summer in Hong Kong. The event will take place on the 8th of June at the Hong Kong Stadium with a capacity crowd of 40,000 expected. The match in Hong Kong is am sure to be a money spinner for the football association in the country and will be a great way to attract football interest in a country that is starting to get football fever back. The game was promoted this week with two well-known faces from both sides turning up in Hong Kong to advertise the match. As seen with Luis Garcia and Karl-Heinz Riedle pictured above showing off both teams shirts. Other players that are likely to be seen from the Liverpool side are ex-players Jamie Carragher, Steve McManaman, Jason McAteer, Patrik Berger, Vladimir Smicer, Robbie Fowler, Dirk Kuyt, Daniel Agger and Djibril Cisse. While the German side will have a host of well-known faces in European football such as Julio Cesar, Dede, Mladen Petric, Roman Weidenfeller, Mohamed Zidan and Jan Koller. Then for anyone in Hong Kong on the 8th June the tickets go on sale on the 23rd of April and prices start at HK$260.